Searching for a job can be a long and daunting task. You have to research companies, edit your resume, and carefully craft cover letters. Even then, according to Interview Success Formula’s 2013 study, you only have a 20% chance of actually getting an interview. And once you get an interview, the hiring process is much longer than in the past. The job interview process has increased nearly 17% since 2010 according to Glassdoor. On average, it now takes 22.9 days, up from 19.6. After reading these studies, we wanted to learn how the job hiring processes of major companies stacked up. To find out, we looked at hundreds reviews on Glassdoor from software engineers who applied to thirteen popular tech companies. We identified trends in the interview processes and calculated the average length of time interviews took at each company. 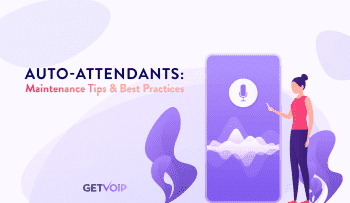 Here at Getvoip, we strive to make our interview process optimal and conducive to both parties, so it is interesting to survey and study these results. In addition to analyzing the hiring process, we also looked at the interviewees experience. Was it positive or negative? Hard or easy? It turns out, an easy interview process did not always correlate to a positive interview experience, and a difficult interview process didn’t always correlate to a negative experience. For example, Twitter’s interview process was moderate (3.1/5.0), but an overwhelming amout of interviewees (42%) had a negative experience. Conversely, Google had the hardest process (3.4/5.0), but only 15% of people had a negative experience, and 56% of people had a positive experience. The interview process itself, on average, ranged from two weeks to four weeks. Surprisingly, the length of time the process took did not seem to influence an interviewee’s experience. 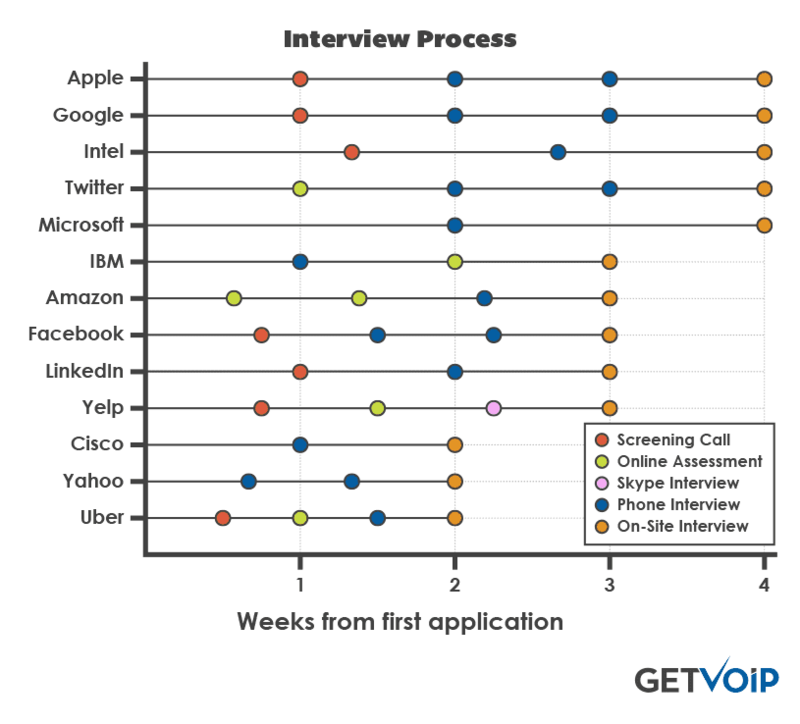 While Cisco, Yahoo, and Uber had the shortest interview process of two weeks, only interviewees at Cisco had an overwhelmingly positive interview experience. 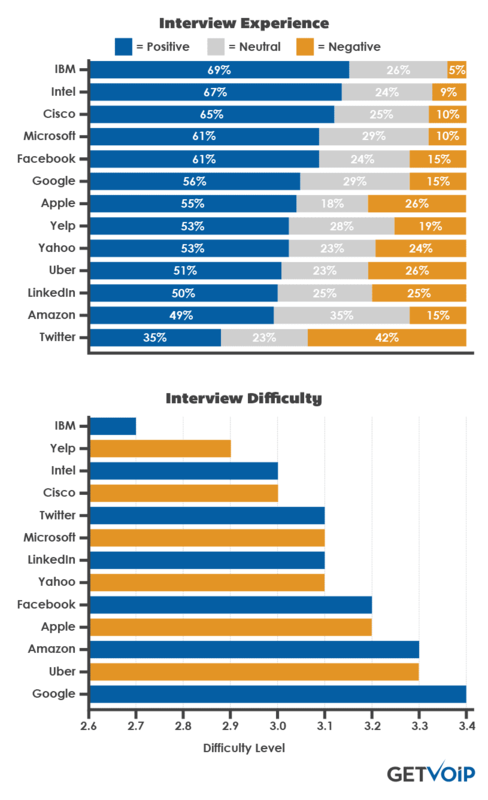 The chart below shows the interview process at fifteen popular tech companies. Interview methods include phone screens with HR and recruiters, technical phone interviews, online tests and projects, Skype calls, and on-site interviews. As we did not have sufficient data to measure the time between each step in the interview process, we spaced each step equally. 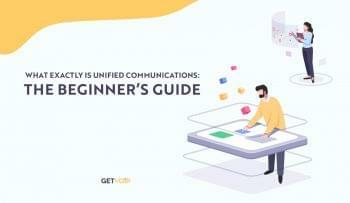 Although this data is specific to software engineers, we believe that it still exemplifies how the hiring process in many industries goes beyond just the traditional phone call and in-person interview. Today, there are multiple rounds of phone/Skype screenings and test projects before you even qualify for an onsite interview. The visualizations above give you an idea of just how intensive the hiring process can get, but don’t let the process discourage you. Though the job hiring process may seem intimidating, there are plenty of resources available that can help you ace an interview. As our data shows, a little research can help you understand a company’s hiring process and zero in on the types of questions they will ask you. To further understand the company you’re interviewing with, follow them on social media and read their blog. 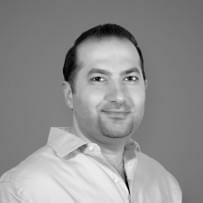 You’ll be able to get a feel for the company’s values, as well as how they approach problems and highlight successes. 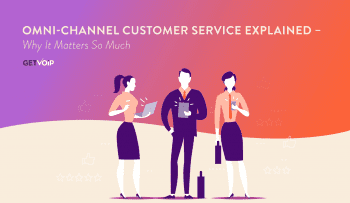 Finally, you should look at Glassdoor reviews to better understand a company’s particular interview process, as well as get a feel for the types of questions that they’ll ask. While the job hiring process may be getting longer, you can leverage the growing number of resources available to you, and master the interview process, as long as you are willing to put in the effort!